I normally just write reviews for the films I see opening weekend, however, after seeing this masterpiece I couldn't wait to get home and write about it. At first glance I wondered how they were going to make this incredible true story silver screen worthy, but with Danny Boyle heading the project I figured it was bound to be good. And good doesn't even cut it (no pun intended). 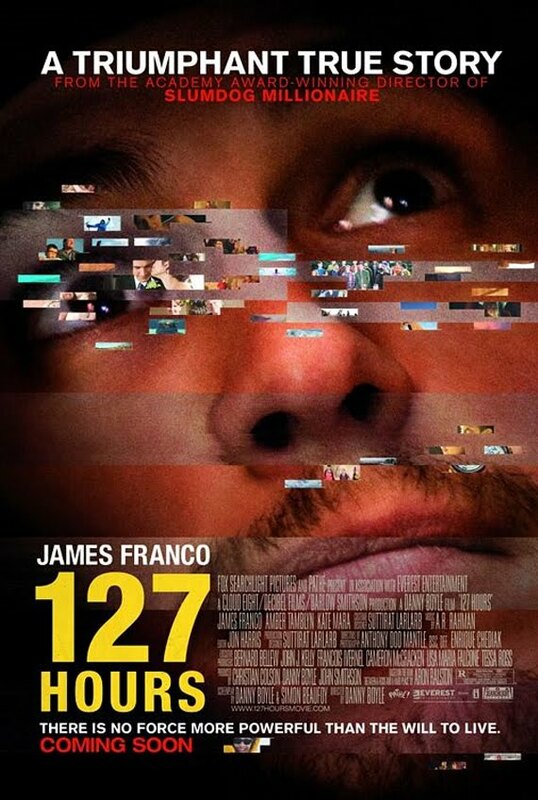 127 Hours is a triumphant. This film is one of those amazing survival stories and easily one of the most inspirational films you will ever see. Aron Ralston (James Franco) is an outdoorsy, adrenaline junkie who doesn't give a second thought when heading out into the deserts of Utah by himself for a little fun and exploring. One afternoon, well into his hiking, he slips and inadvertently pulls down a large boulder with him. 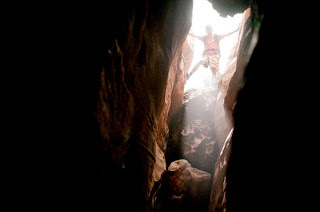 It wedges between the walls of the canyon, pinning his lower arm to one side, thus trapping him there. Yelling for help is no good as no one is near by and after accessing his situation he tries to finagle a way out. However, his freedom comes with a price. Danny Boyle does it again. His beautiful, adventurous and sharp angels, his use of color and edgy editing all continued to wow me throughout the entire movie. I was very impressed with Boyles style. As for Franco's performance - he's definitely come a long way from his early Spider-Man days. He is truly one fine actor with never before seen talent. He did such an outstanding job carrying the whole movie on his back. I just love him! I would not be surprised if he was nominated for an Oscar. He definitely earned it with this film. And now on to the inevitable dirty deed - the gore in this film, though brief, isn't pretty. Boyle does not shy away from it, it's extremely realistic. I seriously had to turn a way during the 2 minute plus struggle to freedom. No doubt Aaron was reckless and a little foolish for venturing out on his own without telling a single soul where he was going. But I feel it's his fearlessness that also gave him the balls to do whatever it took to get out of that sticky mess and back home again. I have no idea what I would have done in his shoes. I parrish the thought. In the end, 127 Hours is about joy rather than agony, it's about victory rather than defeat - a truly inspiring story. Even though it's a powerful, intense movie, I guarantee you will leave the theater feeling illuminated. I loved the music in the end too, I definitely teared up. If you can stomach a little gore, I highly recommend seeing this movie immediately. I didn't even know they made this story into a movie...its sounds great. So after seeing this I was doing a bit more research on the guy and a friend of mine in Utah said that Aron is kind of a tool, but either way this was a great movie. I'm so glad I got to see it.